^ Ridley, H.M. 1924. Nepenthaceae. The Flora of the Malay Peninsula 3: 21–25. ^ Danser, B.H. 1928. 15. Nepenthes gracillima Ridl.. [pp. 296–300] In: The Nepenthaceae of the Netherlands Indies. Bulletin du Jardin Botanique de Buitenzorg, Série III, 9(3–4): 249–438. ^ Kiew, R.G. 1990. Pitcher plants of Gunung Tahan. Journal of Wildlife and National Parks (Malaysia) 10: 34–37. ^ Macfarlane, J.M. 1914. Family XCVI. Nepenthaceæ. [pp. 279–288] In: J.S. Gamble. Materials for a flora of the Malayan Peninsula, No. 24. Journal & Proceedings of the Asiatic Society of Bengal 75(3): 279–391. ^ 13.0 13.1 13.2 13.3 13.4 13.5 13.6 13.7 13.8 McPherson, S. 2009. Nepenthes alba and Nepenthes gracillima 互联网档案馆的存檔，存档日期2011-07-27.. Carnivorous Plant Newsletter 38(4): 102–106. McPherson, S.R. & A. Robinson 2012. 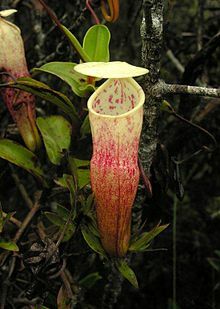 Field Guide to the Pitcher Plants of Peninsular Malaysia and Indochina. Redfern Natural History Productions, Poole.